SAN FRANCISO, CA. — San Francisco fans celebrated after Madison Bumgarner made baseball history by pitching the Giants to their third title in five years with a 3-2 win over the Kansas City Royals in Game 7 on Wednesday night, Oct. 30, 2014. Bumgarner came out of the bull pen and threw 5 scoreless innings after just two days rest, getting the save on the road and adding to his post season legacy. Source: Associated Press. Photo shows 2014 World Series MVP Madison Bumgarner speaking with MLB Network’s Matt Yallof about coming into Game 7 of the 2014 World Series. 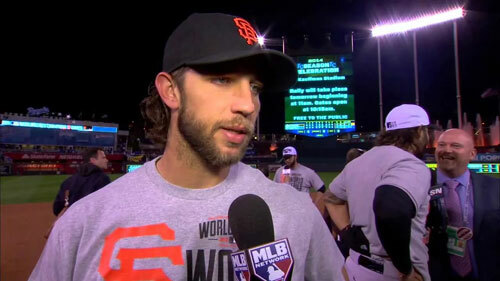 Watch the following video where Madison Bumgarner is speaking with MLB Network’s Matt Yallof about coming into Game 7 of the 2014 World Series on a short rest to become the MVP. Bumgarten made his major league debut in 2009 with the Giants. In 2010, he began the season in the minor leagues but was called up midway through the season and wound up becoming the youngest left-handed pitcher to throw eight scoreless innings in a World Series as the Giants won the 2010 World Series, their first since 1954. He got off to an 0–5 start in 2011 but managed to finish with a 13–13 record. In 2012, Bumgarner set a career high with 16 wins and won his second World Series. He had the best ERA of his career in 2013, at 2.77, and started on Opening Day for Giants in 2014. On October 21, in Game 1 of the 2014 World Series, Bumgarner pitched seven innings of one-run ball. Although his streak of scoreless innings was snapped at 21 2/3 when he gave up a home run to Salvador Pérez in the 7th inning, the Giants ace earned his third career win in World Series competition as his team defeated the host Kansas City Royals 7-1 in Kauffman Stadium. Describing Bumgarner’s steel-trap performance and personality, Giants manager Bruce Bochy said. “This is a big stage, a loud crowd. But he just keeps that maniacal focus. He’s as good as anybody I’ve seen at it.” On Oct. 29, 2014, Bumgarner pitched the Giants to their third title in five years with a 3-2 win over the Kansas City Royals in Game 7. Sports Speakers 360 is a booking agent for pro athletes. If you would like to book Madison Bumgarner for an appearance, contact Madison Bumgarner’s booking agent at Sports speakers 360. For booking agent and appearance fee information on how to hire San Francisco Giants players for appearances, call 1.855.303.5450.